Home / Roundtrips / Guess Who? Out of all of us who do you think the most daring would be? Jamal? Hops? This video will answer that question! More on our Facebook page… join us! 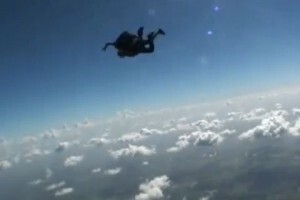 This entry was posted in Roundtrips and tagged Houston, Skydive Houston, Skydiving. Bookmark the permalink. What an awesome video…I just came home from the Aug 21st Michael Buble concert and heard Naturally 7 for the first time and you guys were soooo tight!! Absolutely incredible!!! I got the CD/DVD and I’m watching it right now!!! But the cool thing that I want to tell you is that Sunday Aug 22, 2010, I am going to skydive for the first time!!! I thought that was a very cool connection…I can’t believe that I just experienced “the jump” with you and now I get to take that with me tomorrow…thank you for being such an inspiration!! Your spirit and passion are contagious! Keep doing what you’re doing…it fits you well and makes the world a nicer place to be in!! Cheers! Your “skydiving pal” from Vancouver BC!! !